The very first time I cooked Thanksgiving meal, I went a little bit crazy. 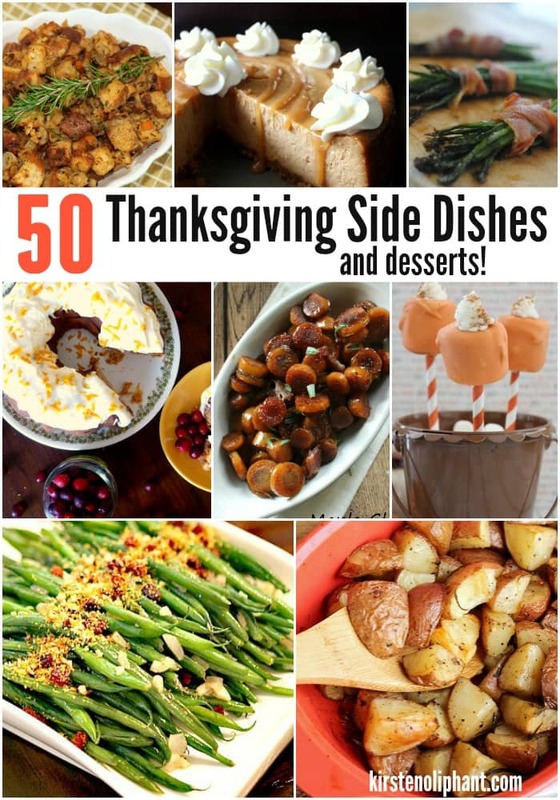 I had so manyThanksgiving side dish recipes (plus Thanksgiving Desserts) that I couldn’t hold back. I made four pies, mashed potatoes, sweet potatoes, green bean casserole, rolls, and stuffing. I used 3 pounds of butter. Let me say that again: THREE POUNDS OF BUTTER. Did I mention I was cooking for three people? I spent the next few days in a food coma/food hangover, but I lived to tell the tale. I can take or leave turkey (though my husband’s fried turkey is INSANE), but for me it’s all about the Thanksgiving side dishes. I love them. All of them. Except maybe cranberry sauce. And the pies!!! Sometimes it’s easy to get into a rut, though, or to get totally stressed out. Like the year I cut off part of my finger into the stuffing (GROSS) and backed over my stroller on the way to the inlaws. Oops. Let’s make Thanksgiving a little less stressful with this roundup of Thanksgiving side dish recipes. Some are more traditional, some more creative. ALL of them look delicious. (And maybe half of them are desserts involving pumpkin.) Now you don’t have to scour the interweb, but can find all your recipes right here. You’re welcome. And maybe, just maybe, you can make lasting and special memories of family & food like these from The Gleeful Gourmand. Now that you’ve got your Thanksgiving side dish recipes under control, what about that turkey? You’ve got an incredible list of recipes. Thanks for including mine. Thank you so much for sharing my recipes. Checking out the others now. Shared! Thank you for sharing some of my desserts! This whole list sounds amazing. I will definitely be Pinning some of these recipes. 🙂 I also have to admit I totally laughed when I read about your 3 lbs of butter… tends to happen around here, too! Ha! OH MY! This is a fabulous list of things for me to try! Thanks for including one of mine as well. Oh, and I love the look of your commenting system. You’re welcome! Thanks so much for sharing great looking foods! I’m starting to work on my menu so great timing! Thanks!